West Bengal Civil Service WBCS Previous Year Question Prelims Papers can be downloaded in this section. We have given year wise old exam question papers for WBCS Preliminary Exam. The Question Papers can be downloaded in PDF format in English and Bengali Language. Old question papers are very important and need to be practiced frequently if you are seriously preparing for the exam. Though WBCS changes their exam pattern periodically, you need to keep in touch with the previous years question paper. At least you need to solve last 10 years question papers to strengthen your preparation. MCQ Questions with answers / solution /answer key and solved model papers for WBCS can be found on our website www.jobsandhan.com. WBCS preliminary written test is held offline. To visit the official website of WBPSC, visit the link given at the last of the page. 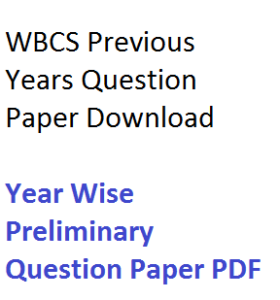 Click to Download – WBCS Prelims Model Question Paper PDF. Year wise question paper is given in PDF format. Click on the link given here. You need to have PDF reader to read the files. It can be saved in mobile as well as PC also. WBCS 2018 Question Paper Download – Click here with solution. WBCS 2014 Preliminary Exam Question Paper Download (PDF Link) – Download PDF WBCS 2013 Preliminary Exam Question Paper Download (PDF Link) – Download PDF WBCS 2012 Preliminary Exam Question Paper Download (PDF Link) – Click Here. WBCS 2011 Preliminary Exam Question Paper Download (PDF Link) – Click Here. WBCS 2010 Preliminary Exam Question Paper Download (PDF Link) – Click Here. WBCS 2009 Preliminary Exam Question Paper Download (PDF Link) – Click Here. Official Website of West Bengal Public Service Commission – WBPSC Online – Click here. Kindly send me last 10 years WBCS preliminary Question and Answer….in my email. Kindly give me,last 10 years WBCS Preliminary question papers..
sir i willbe regreted if send me wbcs preli previous 10 year solved paper in my email. sir i will be regreted if you plz send me wbcs previous 10years solved paper in my email. I am 2nd year student in chandannagar institute of management & technology under burdwan University,.Plz send me 10 yrs. solve WBCS question paper. I am M.A.complete from Rabindravaraty University, Kolkata.Plz send me 10 yrs. solve WBCS question paper. please send me west bengal audit and accounts preliminary solved question paper. Please send me wbcs preliminary solved question papers of last 10 years and model papers also, from here I can download only 2013 & 2014. Other clicking option are not working.Thank you. We will upload very soon the other previous years question papers.